It was a pleasure road trip from Bengaluru to Mysuru via Shivanasamudra falls and Ranganathaswamy temple. We were late in reaching Mysore Palace due to heavy traffic in the city. We had to park our vehicle at some distance from Mysore Palace due to heavy rush here too. 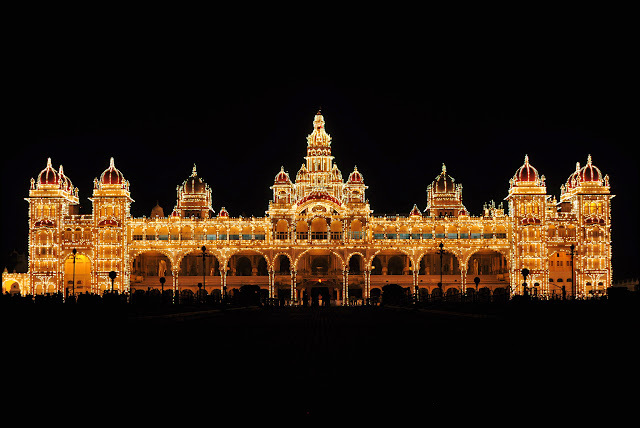 Extra gyaan: Mysore Palace (also known as Amba Vilas Palace) is the official residence and seat of the Wodeyars - the Maharajas of Mysore, the royal family of Mysore who ruled the princely state from 1350 to 1950. Mysore place was built by the Maharaja Rajarshi His highness Krishnarajendra Wadiyar IV. 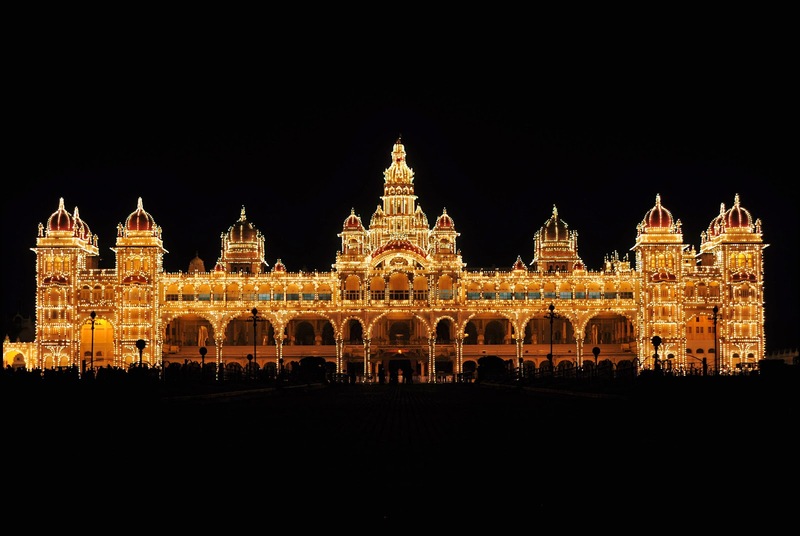 You will be flabbergasted the moment you will see the Mysore Palace decorated with over 96,000 bulbs glowing like shining diamonds. The night was a special one. It was the tenth day (Vijay Dashmi) of the 10-day long Mysore Dasara festival. Every autumn this festival is celebrated with pomp and glory with leading artists performing on stage set up in the palace grounds. On Vijay Dashmi, a parade with caparisoned elephants and floats originate from the palace grounds. We were feeling sad for missing the same in the afternoon. We saw thousands of foreign and Indian tourists along with locals who had come here to see the palace and celebrate the Dasara festival. The entry to the inside of the palace was closed for the day and people were allowed to see the palace from grounds only. We clicked loads of pictures here. The palace was glowing with pride and royalty. The Dasara festivities have become an integral part of the culture and life in Mysore. 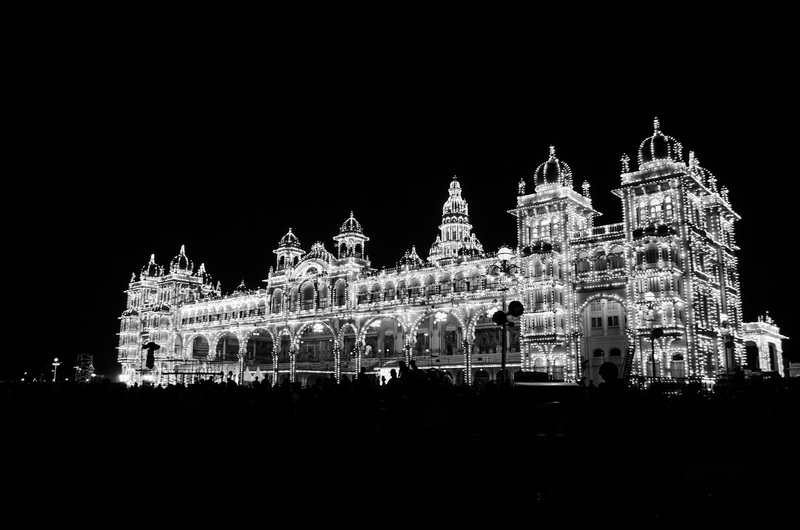 To celebrate this festival, the Palace of Mysore is illuminated with more than 96,000 lights during the two-month period (September and October). For those visiting in other months, make sure to don’t miss the illumination on Sunday night/public holidays (7 pm – 7: 45 pm). The bulbs are lighted just for one hour and then shut off to conserve energy. So make sure you reach well in time in order to avoid missing the magic. After enjoying for over an hour along with eating some chaat pakori outside the palace premises, we went to back our hotel. Next day we had planned to explore the city. We left our hotel early to visit Chamundeshwari Temple on the Chamundi Hills. The temple is about 13kms away from the city. The temple was named after Goddess Chamundeshwari or Durga, the fierce form of Shakti. You will be excited to know that Mysore was earlier known as Mahishur, traces its history to the mythical past when Goddess Chamundeshwari killed the Buffalo-headed demon Mahishasur. In fact, this depicts the victory of good over evil and is celebrated as Dasara. You will be welcomed by a huge statue of Mahishasur at the entrance of the temple premises. The Chamundeshwari Temple is considered as a Shakti Peetha and one among the 18 Maha Shakti Peethas. The temple can be visited each day during different time slots. There are different queues based on the amount of ticket you purchase. 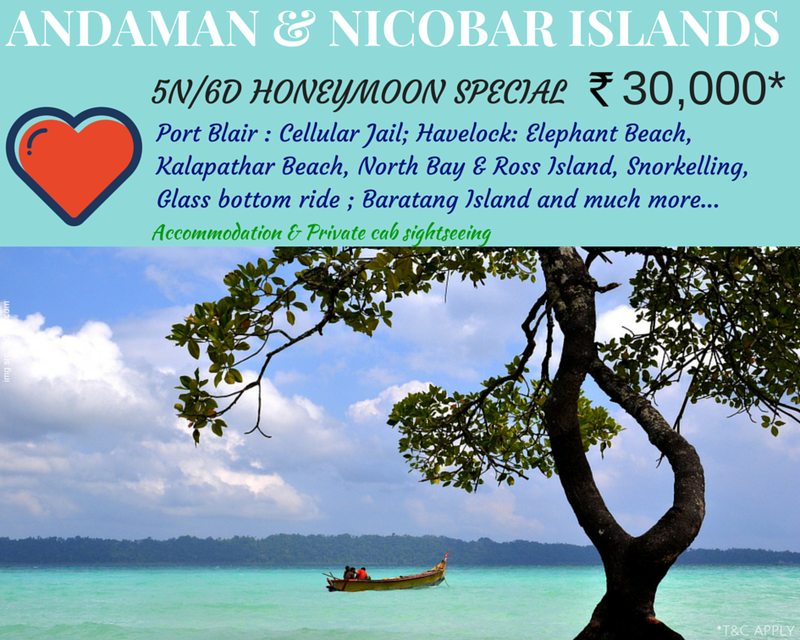 Starting from Rs 0 (free darshan line) to Rs 500 (VVIP Line darshan line). You are not allowed to take camera inside the temple. The main deity here is Chamundeshwari, seen seated in a yogic posture, serene and peaceful. This is a temple much visited by locals and tourists. People come from far and wide, not just for the blessings of the goddess, but also for the beautiful views of the city that the hill’s vantage position offers. Besides, there is also the Nandi, which is a prime attraction here! It’s not just the size, but the detail, which captures the attention of the tourists here. Nandi, or the Bull, is the vehicle of Lord Shiva, and he stands outside a small cave shrine of the lord. Carved out of a single black stone, at a height of 15 ft and a length of 25 ft, he towers over everything else here. There are swings in the backyard along with few other ancient temples to visit. After offering our prayers we left for the rest of sightseeing in Mysore City. We passed University of Mysore. On the streets Dasara celebarations were still visible. Hope you enjoyed the blog! Keep sharing the same with your friends and family.